Here are some examples of our work and designs we can achieve. These examples show different kinds of textures, finishes, techniques and styles. 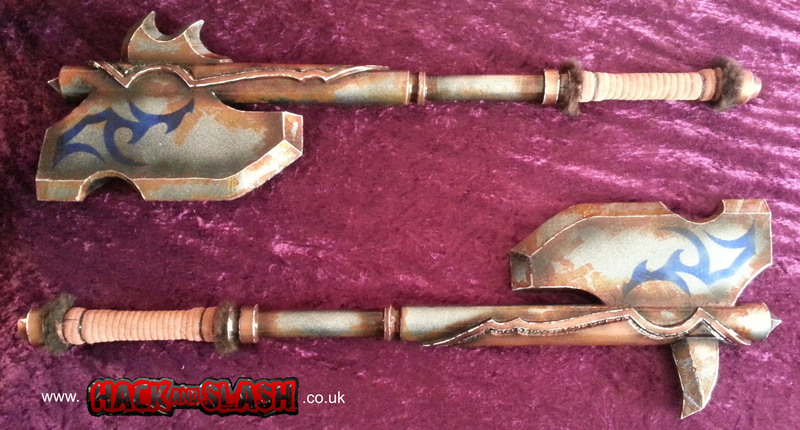 We can also make sets of weapons for groups that want some continuity with their props. Templates and colour choices can be saved on request and recorded so if you would like any more made down the line to the same standard, size and style, then it can be done! All our weapons are made to meet the requirements of most major Role-Playing systems in the UK and pass an in-house weapons check before being dispatched to the customer. Prices stated below are examples of the cost for the items, however, please remember that all finishes, colours etc. on the weapons and props can be changed to what ever you want. If you would like to make an enquiry for this bespoke service, please find our email of fFB details by clicking here. A quote costs nothing! Alternatively if you would like to see more examples of our work, we post photos to our Facebook page regularly. There is plenty of pictures to see there and you get to keep up to date with the projects we’ve been up to! The picture of this weapon does not do it any justice. The detailing that is put into this Glaive can be marvelled at close range, whilst not losing feel, visually, from a distance. Its practicality has not been compromised for detail and has several new techniques applied to it, including a matt finish so it won’t reflect light in the dark giving away your position. This weapon is, quite simply, a masterpiece. Sent photos as a guide, we built these weapons with a little studio finesse. The carved and embossed detail really makes them a centerpiece of anyone's collection. Lord Jhereg's falcatas-style sword. This was a project where we were given a guide, but also artistic licence. So this is what we came up with. A gorgeous weapon for a powerful figure. The photo doesn't do this weapon justice, we included subtle chipworking and a bleed in effect from the hilt to the blade. From blade tip to pommel end, this is a beautiful weapon. Multiple leathers on the grip, engraving, stylised pommel to reflect the blade details, gradual metallic effect, chipwork, airbrushing, hand painting.. It's lovely! 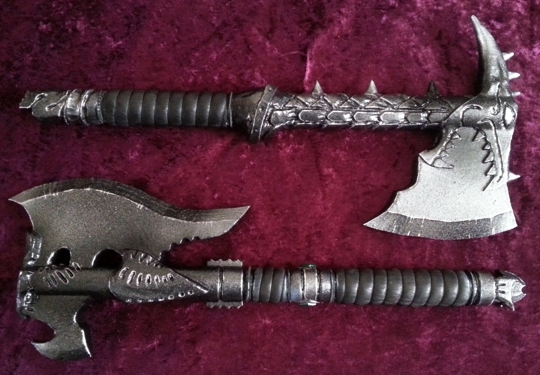 These axes are part of a kit for a player within the Knight Mortis. They are an awesome group within the CP system. This is a very over looked group that has one of the most complex backgrounds we've ever seen. Massive opportunity for some really deep, immersed role-playing, with tons of action! This is an exceptionally versatile weapon. A fantastic example of how we can build native weaponry which can fit with so many character types within a fantasy system. This torture kit was built for a 'Medic' within the Trinity Games, 'Green Cloaks' system. Fantastic props for those who want to push the boundaries of LARP and really make a performance out of life changing scenarios. Having the opportunity to make this weapon was an honour. As you can imagine it was not easy due to its size, although technically simple. The over-rusting effects and chip-work were all important to making this weapon look the part and paying special attention to colouring the whole thing was key to tying it all together seamlessly. Looking at the picture, you cannot tell that it is in fact the size of a doorway! 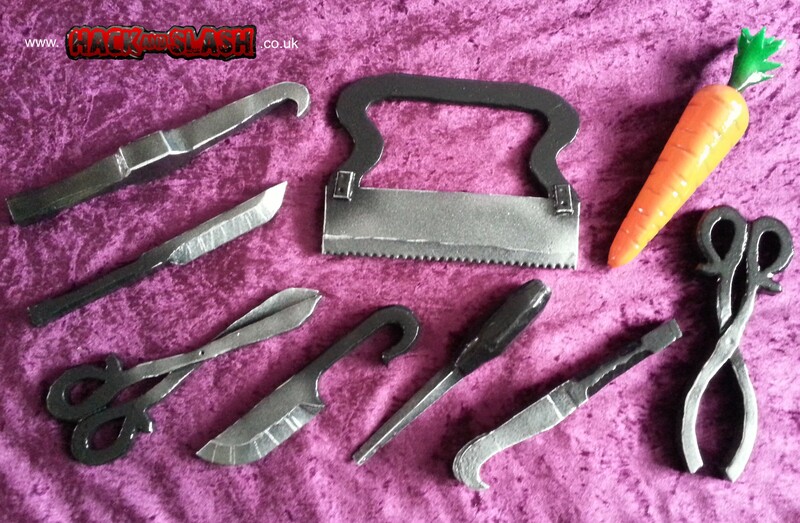 All this was made specifically for the purpose of increasing the experience of a Blacksmithing Character. Yet again going that extra mile to make your character all it can be puts you in the history books and makes sure you are spoken of even when your character is long gone. One of the greatest things about this weapon is its finish. It uses something called tertiary colouring in NMM (non-metallic Metal). All the effects are created through colour and not through the combination of colour and metallics. It can be used by a multitude of different races and will comply with many more themes. If presence and power is your thing, this is the weapon for you. 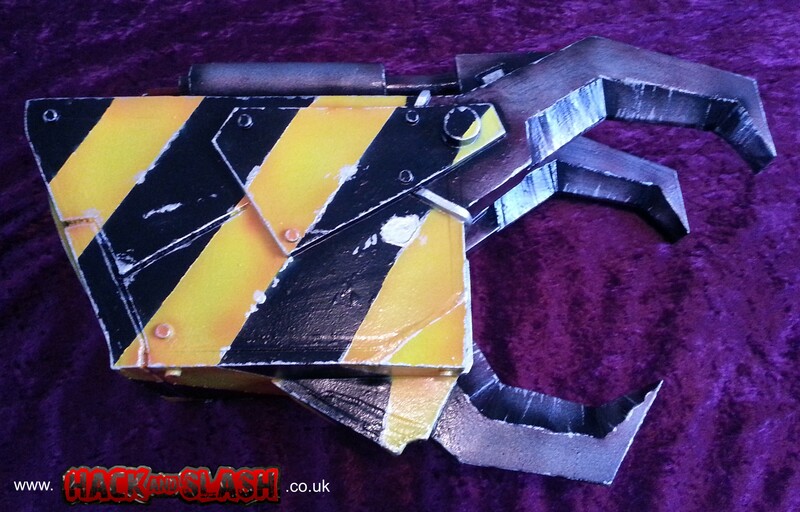 Pictures of this claw have turned heads all over the net and the owner is one lucky, lucky man.